Better than pumpkin bread! 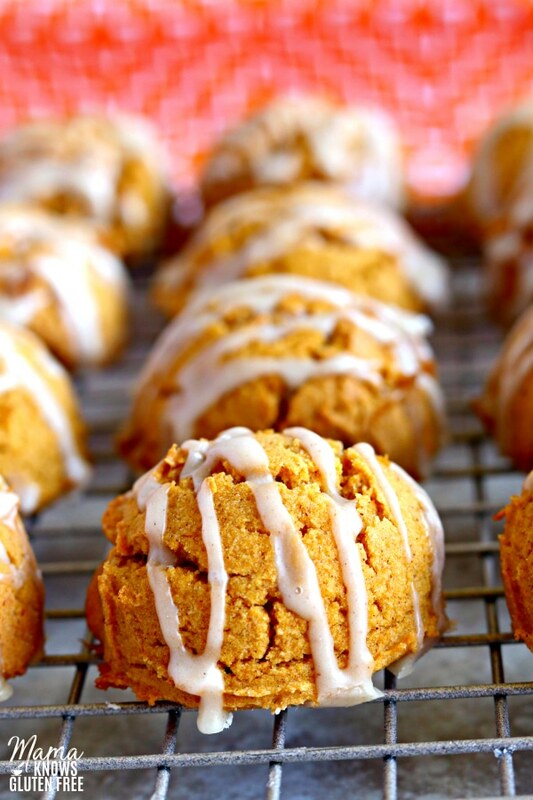 These gluten-free pumpkin cookies are super moist, yet light and fluffy. Everything you love about pumpkin bead wrapped up in a cookie. An easy gluten-free cookie recipe your whole family will love. Original recipe published October 2017, photos and post updated September 2018. 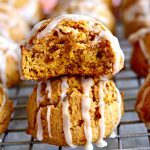 I love pumpkin bread, but I love these gluten-free pumpkin bread cookies even more! These bite-sized gluten-free cookies are moist, fluffy, lightly spiced and drizzled with a vanilla maple glaze. 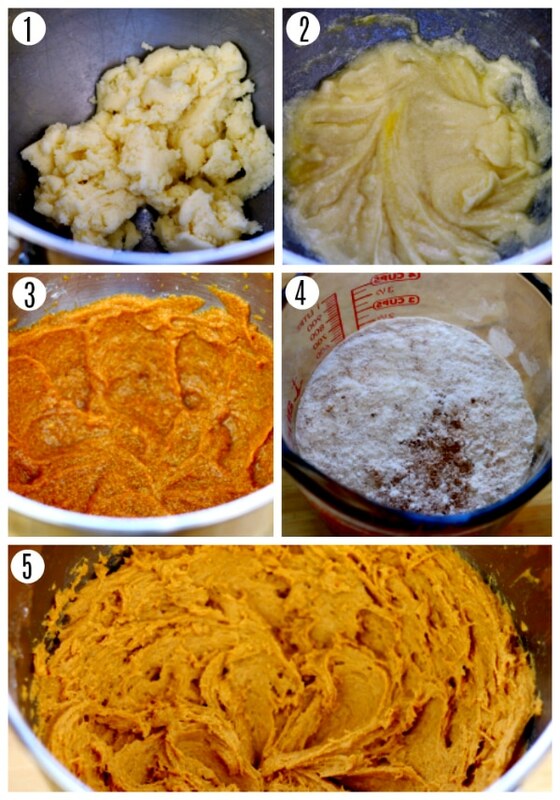 You will be surprised at how easy this recipe for gluten-free pumpkin bread cookies really is. The first thing you are going to want to do is to add the baking soda to canned pumpkin, stir to combine and set aside. 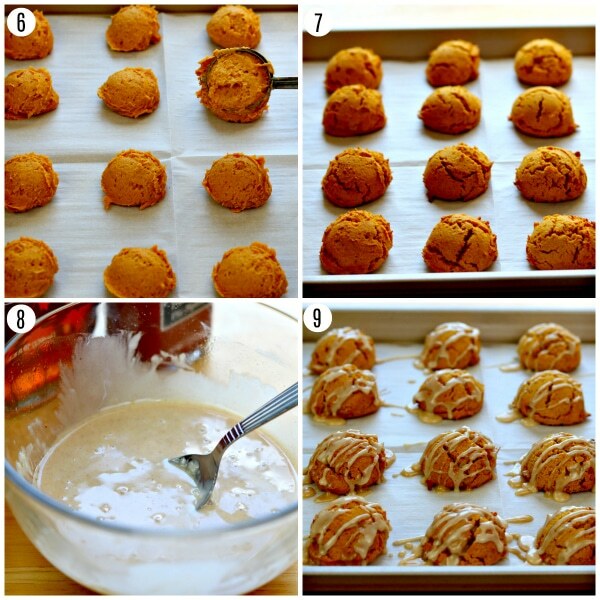 The key to this recipe is the chemical reactions between the pumpkin and baking soda. Allowing the pumpkin and baking soda to sit for at least 2 minutes before adding it to the rest of your ingredients is key to what makes these gluten-free cookies so light and fluffy. After the cookies have cooled, store them in an air-tight container. Always bake with ingredients that are at room temperature. I always use room temperature eggs. Cold ingredients do not mix as well with room-temperature ingredients (like flour). This can cause the cookies not to be as fluffy and light. For uniformed sized cookies, I always use a cookie scoop. It makes it nice and easy to get the perfect amount. I also like to use parchment paper to line my baking pans. I have also included a dairy-free option to my gluten-free pumpkin bread cookies recipe. My husband, my youngest son, and I are all dairy-free. 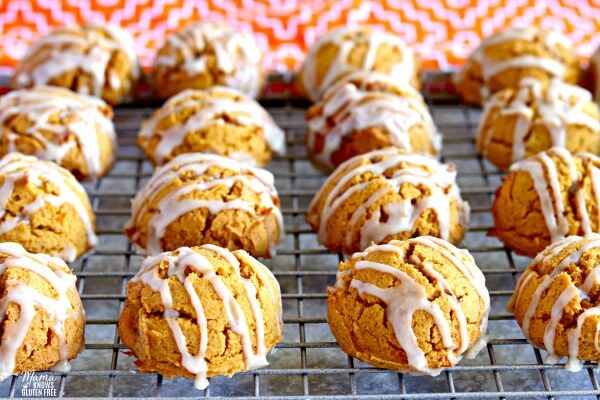 I promise these iced pumpkin cookies are just as delicious made with the dairy-free butter. So, you too can enjoy a gluten-free and dairy-free pumpkin bread cookie. My family always rushes to the kitchen as soon as I pull them out of the oven, and the first batch disappears before the second batch is even done. These little beauties don’t last very long in my house. These cookies are everything you love about pumpkin bread wrapped up in a cookie. Full of the pumpkin spice flavor you love! 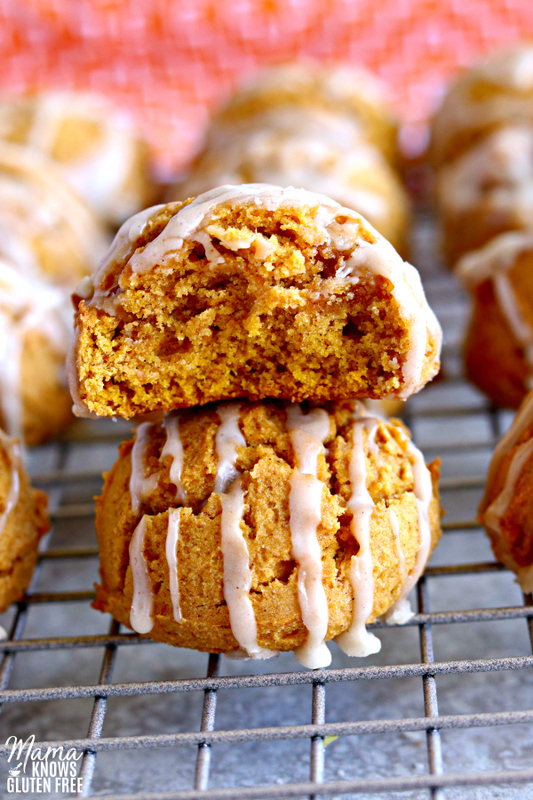 For more gluten-free pumpkin recipes, check these out! Better than pumpkin bread! These gluten-free pumpkin cookies are super moist, yet light and fluffy. An easy gluten-free cookie recipe your whole family will love. Add baking soda to canned pumpkin, stir to combine and set aside. The key to this recipe is the chemical reactions between the pumpkin and baking soda. Allowing the pumpkin and baking soda to sit for at least 2 minutes before adding it to the rest of your ingredients is key to what makes these gluten-free cookies so light and fluffy. In a large bowl cream the butter and sugar together. Add the egg and beat until the mixture is light and fluffy. Add the canned pumpkin (with the baking soda mixed in) and pure vanilla extract into the butter mixture and mix until fully combined. Combine the gluten-free flour, salt and spices in a medium-sized bowl and stir to combine. Pour gluten-free flour mixture into the pumpkin mixture and mix until fully combined. The cookie batter will be thick. Drop large spoonfuls of the cookie batter onto a parchment paper-lined baking sheet. I use a cookie scoop for this recipe. The cookie scoop makes for the perfect amount and size. If you don’t have a cookie scoop, please buy one. My cookie scoop has been a game changer for me! Bake for 15-20 minutes or until bottoms of the cookies are lightly golden brown. Combine all the glaze ingredients in a small bowl. Stir until fully combined. Drizzle over warm cookies. Enjoy! Store cookies in an air-tight container. Add the baking soda to canned pumpkin, stir to combine and set aside. The key to this recipe is the chemical reactions between the pumpkin and baking soda. Allowing the pumpkin and baking soda to sit for at least 2 minutes before adding it to the rest of your ingredients is key to what makes these gluten-free cookies so light and fluffy. We just made these tonight! Absolutely in love with them! I made a spiced glaze for them and will be making them again! 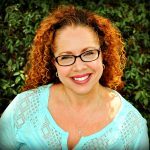 Thank you so much for the wonderful 5-star recipe review Amanda! I am so happy that you enjoyed the pumpkin cookies. A spice glaze sounds delicious! Thank you again.